In the time since we bought the tickets, we did actually buy an RV... but the RV is located in the city of Adelaide, and we arrive in Melbourne. The two are relatively close to each other... sort of! It's an hour and twenty minute flight. Or, a ten hour bus ride! So we needed to find a way to get ourselves to Adelaide. It turns out that the bus would cost $60 AUD ($58 CAD, $44 USD) each for the one way ten hour ride. Not bad. We arrive in Melbourne on a Saturday, and the cheapest tickets were at $49 on the following Wednesday. And only $10 more for the Tuesday flight. Having never been to Australia, we think it's a good idea to explore the city of Melbourne first... since we're going to be there anyhow. Just this morning, I booked the Tuesday flight for $59 AUD ($57 CAD, $43 USD). So, we will have 3 nights in Melbourne to explore. Then, we fly to Adelaide on the Tuesday morning and go directly to the storage place to pick up our RV. We will be on 7 different airplanes over the coming 5 weeks or so! AUS (Austin!) to LAX to YYC to YOW to YYC to LAX to MEL to ADL. And once we get to Adelaide we will then figure out were we are going. It somewhat depends on the weather. We realize that it's winter just starting down under, but the winters there are not like the winters in Canada. They supposedly have high temperatures at that time between 10C and 17C (50F to 64F). But if it's colder along the southern coast we will stay inland and head directly through to Sydney and Brisbane area where it's usually a bit warmer. However, that is just a very rough idea... the finished route may look entirely different even though it's in the same general area! Then, come August we will need to already have a plan for Bundy and Joyce. Bundy (the truck) and Joyce (the camper). Looking forward to taking our own photos like that! Do we sell the rig? Do we keep it and rent it out? Do we store it and come back to see more? Do we share the cost with friends? Lots of choices. And so the planning continues. Record low price on the RV 770 GPS Unit. Yep, this is going to be a fantastic trip! Sounds like a fun adventure, though a lot of flights, Exploring Australia will be fun and we will enjoy seeing it with you. Nice to have some flexible plans. We are going to have a great time exploring Australia, and when you are traveling like the way we do you need to be flexible. One of the big dangers in Australia (besides driving on the wrong side of the road) is that the turn signal and windshield wiper controls are reversed. So without thinking you go to signal for a turn and the wipers come on, and everyone knows you're an idiot. Just returned from Australia with a tour. My advice? Don't drive in Melbourne. They have 'Hook" turns. They look quite intimidating combined with driving on the left. Also, Melbourne is teeming with people on sidewalks, and there are lots of drivers (with minimal parking). Thanks, but I'm not that worried about driving. We did four months in Namibia and South Africa on the other side of the road. Even drove in Cape Town! I actually just looked up to see what a hook turn is and now that we see it we aren't worried, we have had to deal with these in Mexico a lot, except on the opposite side of the road of course. We have had to deal with hook turns in Mexico, so this won't be anything new to us, but it is good to know that there aren't many of them to worry about. We hope to be off the road during peak driving hours. I vote for keep it there and rent it out. I'm sure you could keep it relatively busy between your readers and their contacts. Second would be to sell it and use that to fund another great trip I get to follow along with. That is more or less what we are thinking too. We are sure that we will want to come back and see more of Australia, it is a big country and there is no way that we can see it all in just one visit. if you plan to rent the RV we may be interested. Time period would be Jan to March. We spent 2 1/2 months in Aussie 10 years ago so it is time to return. We will keep that in mind Tommy, although we know another couple that may also be interested in Bundy and Joyce for the winter. Yep, it sounds like you are due for another visit. It sounds wonderful. We drove from Adelaide up to Uluru, Kings Canyon and Alice Springs with a 2 night stop in Coober Peddy and loved it. Is it equipped inside or do you have to do that? On this trip we will not be headed that way, or at least it isn't in our plans at the moment, the weather will be our deciding factor as to our route. We do want to see all of these places though, but that will most likely be left for another time. Everything sounds so exciting. Wish I was going with you. I need a break myself. We just took on the crazy adventure of 2 puppies and it has been fairly hectic since. looking forward to you adventures in Australia. It does sound exciting and we are so looking forward to this new adventure, it definitely should be an interesting three months. It's my favourite beach - park in the carpark, walk through the shallows of the inlet, turn right at the ocean and walk around the beach past fantastic rock formations. 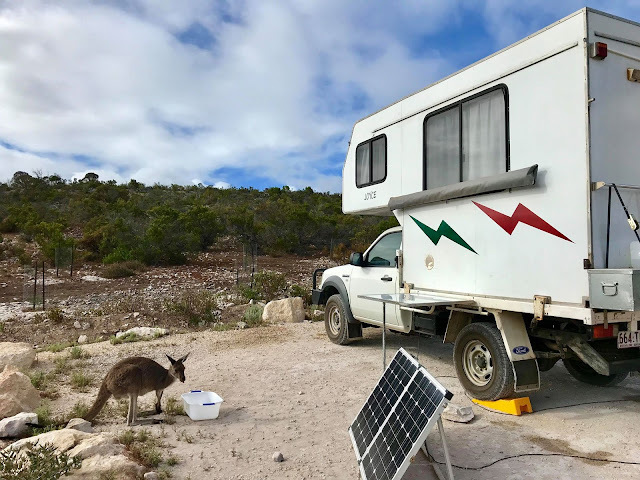 if you drive further down bekka beach rd there are quite a few free camping sites. Also Pambula beach (not Pambula the town) past Eden is beautiful too. Big well run camping ground right on the foreshore. Drive to the end of the rd in Pambula beach to the river mouth and walk along the river at sunset - so pristine with national park and sea eagles. Oysters from the local shed just out of Pambula around AUD$8 a doz if you shuck them yourself. Its a big oyster area due to the clean waters of the lakes. my favourite area so if you need any info just ask.